A friend who has recently relocated to Texas sends along this lovely image of some of the wildlife which routinely shows up on his porch. 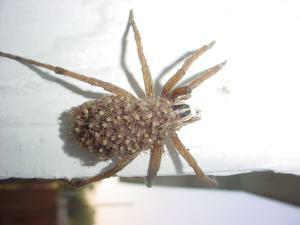 Take a close look; this mama spider is packing hundreds of babies on her back. Isn't it cute? I knew there was a good reason I was living up here in the frozen northlands! Happy Hallowe'en!